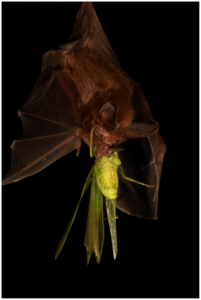 A common big-eared bat eating a katydid!! The katydid is bigger than the bat’s head. No wonder they can afford to stay inside when it’s raining. Photo by Christian Ziegler doi:10.1371/journal.pone.0028584.g001. Hi everyone! I hope you all had a good week! I found a really interesting article about bats. The article is all about the importance of background noises. Some people think that background noise is a nuisance. Bats, however use the noises that they hear outside of their roosts to plan their outings. A group of researchers decided to test how background sounds affected a bat’s hunting habits. The scientists selected two bat colonies, one being the common big-eared bat (Micronycteris microtis) and the other the Pallas’s mastiff bat (Molossus molossus), and simulated the sounds of heavy downpours. When the bats heard the sounds, they stayed in their roosts! Bats don’t like flying in the rain because when their wings get wet, they have to use more energy to fly. Scientists don’t know exactly why else bats don’t like rain, but they believe it might jam their echolocation and their ability to navigate and find their dinner. The bats in the simulation didn’t like rain and decided to stay inside. For a comparison, the scientists also simulated the sound of normal forest sounds. The bats only stayed inside when the rain sounds were playing. The common big-eared bat also sent out a bat to investigate their environmental conditions. If you want to read more about this study, you can find it here. Next StorySpring in Louisiana: Love in the air, bats in the gym!